On the boat again after a month of visiting family and friends. Hard to leave our daughter and son-in-law and their brand-new super adorable little baby boy!!! But happy to be back. Getting ready to leave was way too hectic – cancel the paper, re-route the mail, pay the bills, finish the sunshade, make holiday stockings for the little family in California, (including the dog). 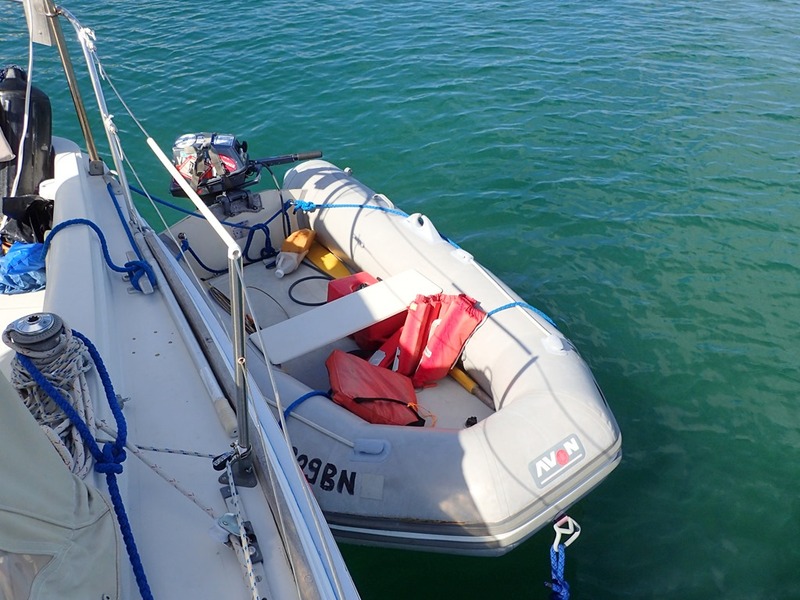 And don’t forget anything – we’d made a list of things to bring down the last time we were on the boat. Probably forgot some of them even with the list but we ran out of room in our bags anyway. Many thanks to friends for accommodating our schedules so we could get together. The flight to Marsh Harbour from Florida was delayed, but we still managed to make the 4 pm ferry, arriving at the boat just before dark. The Donnie driver dropped us off right at the boat, on its mooring at the mouth of the harbor. Backed the ferry up to Motu Iti broadsides without so much as a caressing touch – perfect. We stepped off and were at our Abaco home again. What a beautiful return – temperatures in the high seventies with a nice cooling breeze. Friends came by to welcome us and to warn us of voracious mosquitoes – they were so right – and to congratulate us on missing so many recent rainy days. Now we had transportation. 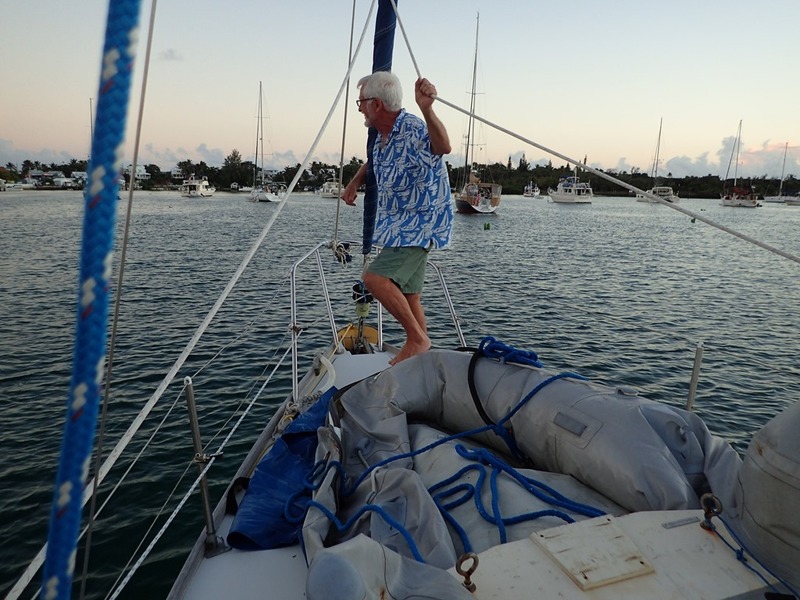 We dinghied to Cap’n Jack’s for taco night, conch fritters and Kalik beer. 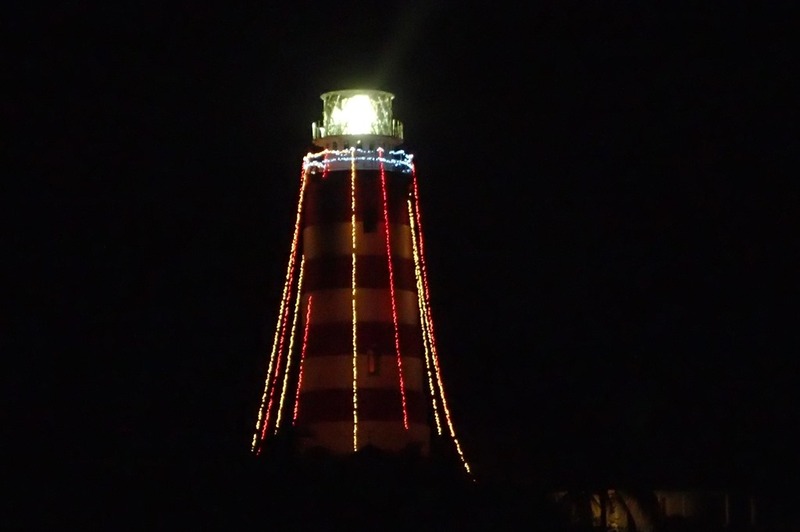 Sitting outside over the water and enjoying this beautiful view of the Hopetown lighthouse in its holiday splendor. We did not linger in town. We were exhausted and fell into our berths at 9 pm. But Hopetown had more in store for us. Precisely at midnight, a fine mist of gentle rain awakened us. Falling onto our faces through the open forward hatch. Not just open, but all rigged up with the wind scoop, (which has to be taken down from the outside before the hatch can be closed). Within SECONDS, the gentle mist turned into a deluge. Like someone was standing on our boat pouring buckets of water into our berths, on our heads, the rain pounding on the deck above us. Lots of hopping around and futile efforts to stop the flood. Finally, ONE of us had to go up top and endure the maelstrom in order to untie and unsnap the wind scoop and close the hatch. We were just starting to figure that out when we remembered that the main hatch was also open. At least no rain was falling on us from that huge hole in the boat and at least it wasn’t rigged to scoop up all the rain and dump it down on top of us. And at least everything beneath it was waterproof. Whew! Finally back to sleep; and a quiet night was had by all. Who went on deck in the rain? Just curious? And of course, gallant Goldie went up. Didn’t he??? Sorry for your rain but I love the way you write. Keep it coming!